The Sun represents our ego. It shows how we shine in life. As such a person with Sun in the first house will have a strong egoic nature and will never be shy. While, this can make the person a prominent figure, it can give the native a desire to outshine others. This native’s father will have a big impact on them, giving them strong ambition, assertiveness, courage, pride, and power. The native will desire a position of authority and will like to be in government jobs. If Sun is afflicted there can be troubles with eyesight. However, if unafflicted there will be good health. In general, this placement gives success and respect in life, and the native will always impress others. If the Sun is placed in Aries or Leo in the first house, the native will be highly respected, famous, and intelligent. This native will have a great start in life, being born into a wealthy family. He or she will be confident, dignified, and powerful. Successes will flourish as the native defeats their enemies and competitors. The father will also enjoy a long life, success, and power.. If the Sun in the first house is placed in Libra, confidence and self-esteem will be lacking. Self-love, self-acceptance, respect, and recognition will be hard to attain. Health problems such as poor eyesight can harm the native. These natives will be often accused and charged in court if other chart factors support this outcome. The native will be disposed to anger and capable of exploding fiercely. Their father’s life will be difficult and short-lived. Because Sun is exalted in Mars’ sign of Aries, it also gives good results in the other Mars-ruled sign, Scorpio. During the 22nd year of life, the Sun gives its full affects. If the Sun rules good houses or is supported by friendly planets, this year will be positive. However, if the Sun is in a bad condition, this year will be difficult. Being the most personal of all the planets, the Moon is similar to the ascendant. As the Moon is waxing, it is considered benefic. The fuller or brighter the Moon is, the more auspicious it becomes. It is important to consider the Moon’s status as waxing or waning to understand its strength in the chart. The Moon gives different effects depending on if it’s waxing or waning. However, if it is only 1 day past the full Moon point, it is still bright, and thus gives good results. A full Moon birth is very auspicious. A waxing moon in the first hoes will make a person attractive with large and beautiful eyes. His or her nature will be romantic and highly passionate. Intelligence and mental pursuits will come naturally to this native. Additionally, he or she will love to connect socially with others. Any profession that deals with the public can have great results. The native will be emotional, moody, and sensitive, and will love to be near bodies of water. Self-centeredness is also seen from this position, because the Moon and the ascendant are the most personal aspect of a person’s chart. A beautiful magnetism will radiate from the person, making them attractive to others. This helps them gain respect, fortune, and happiness. Health will be robust and the constitution will be strong, allowing for a long life. The relationship with the mother will be strong, and their life will flourish with comforts and luxuries. Due to the Moon’s aspect on the 7th house, happiness is promised in married life. However, if afflicted, the Moon will cause mental instability. 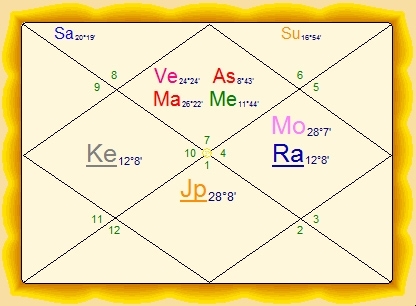 When the Moon is waning in the first house, the native will receive similar results as those mentioned above, yet they will be less fortunate. Good-looks are still seen, but the mind will be unstable and intelligence will not be as great. However, the native will still be a ceaseless thinker. A weak constitution and health problems can be seen from this placement, as well as selfishness and self-indulgence. Unhappiness, poverty, and lack of respect may plague the native, but they will still be recognized by others.. If the Moon is in the ascendant in Taurus or Cancer, the person is beautiful, brilliant, happy, famous, respected, romantic, and magnetic. The native will be born into a wealthy family and have a good start in life. Their married life will be full of happiness as well. Taking birth under a waning Moon will give similar results, but a less optimal. When placed in Scorpio in the first house, bad results are seen and the whole horoscope is affected negatively. This placement gives health problems, a weak constitution, and a short life. Lack of mental stability or even mental problems are seen. It’s likely that the individual will be unhappy and poor, and that the relationship with the mother is not good. In fact, the mother herself may experience hardship and an early death. Extreme self-indulgence and self-centeredness are seen. There will be no self-confidence or self-love. Thus, married life will not be prosperous. Because Moon is exalted in Taurus, a sign ruled by Venus, it does well in Venus’ other sign of Libra. According to the scriptures, the Moon also does well in Aries. The Moon’s effects are given in full in the 24th year of life. At this time, the native will prosper in all activities related to the first house. However, if the Moon is afflicted or waning or a ruler of a bad house, then the native will struggle at this time.